One moment in eternity I peer out from the Souls domain, into the time filled world of human experience. My demeanor of peace and light-filled-joy sees a great possibility in this active world. Challenges appear, wanting for my Soul to engage. I dive deep into the Cosmic Sea. With a swell of promise filling my energy field I head straight for this little island in the middle of everywhere. I am sure of nothing. The unknown that awaits is the adrenaline of my soul’s purpose. It fills me with everlasting, adamantine, Will. This Will that knows no failure. For, all the push and pull of consciousness is only an action to stimulate the presence of the Now. It is a starting and finishing line of all the rotations of the soul’s visits to this tiny space, an acceptance of the game of continued enlightenment. There is a deep shadow cast on the life of this planet now. It is part of the play. It is neither good nor bad, it’s just part of the Dusty Grime kicked up by the momentum of life, along the way of discovery. It affects us deeply only if we succumb to it. There is a way clear of these putrid dust balls, but it takes more than one’s adamantine Will, it takes the courage to stay in Integrity’s Light and not be mesmerized by the deep shadows of earth’s addictive illusion. The following excerpt is Epilogue 2 from “The Way of the Waking World.” It was brought back to our attention by Peggy Beck, who has intuited the true meaning of Letters with great understanding. She has made us retrace our steps along this path of learning and we are truly grateful for her insight. It could never be more poignant than it is now. Take 3 deep healing breaths, read Shadows and Light on Earth, and then breathe those breaths again and exhaust all the illusion with those vibrations of Peace echoing through your body. I sit in the dark morning, meditating on stillness. This meditation has come upon me from within. It has demanded me to wake up and be here with it. It is like a very peaceful person, a presence, a life and consciousness in its own right, coming to me to bring a gift. It is the gift of serene sensibility. I join this life presence and enter its quiet spaciousness. I sit. But then there are thoughts arising. Let them go. Let them flow around and off, away. I re-enter the stillness. Still, there are impressions coming, streaming in from my benefactor, peace. I accept the gifts and place them into my mind and thoughts. They materialize as two forms in one. They are, at once, Omis and Orange, in a single feminine voice. The darkness speaks out of them, into them. “I’m wondering about the last line of the book.” I muster some inadequate, raspy words. Look around you. What do you see of the people who are in your sphere of life? Some are kind and joyful and will extend their arms to embrace you and love you. Others are cold and blank and unable to feel the heart that lives so deep inside their body. This is the way it is. No matter how hard we try to change that dynamic it is here to stay, for now, a potent reality. We have activists performing extraordinary challenges to make changes in our social structure. They pour into the daily dynamic a body and a voice that shouts pleas for change. This is the nature of the third-dimensional conflict. Pull and push, push and pull. But there are others, not as visible, not as strident. They move in subtle ways. They emit their force with the grace of the deeper energetic waves of consciousness. Like the Tao of QiGong, their force moves silently, with the power of a thunderous herd. This is the wisdom of The Holy Unknown. We play into it every day. It is our destiny’s walk. And walk we must, because only death will cease the search. Until next time. to surprise her. She smiles at me and looks over to Ab’th and Iya. They seem to be sensing something that eludes me. have been invited to join their team, to assist in the Grand Reunion. about how important this crazy adventure has become to me. As the summer’s heat burns the noise of conflict deeper and deeper into our chaotic game a new participant enters with a clear and insightful hand, The Holy Unknown. 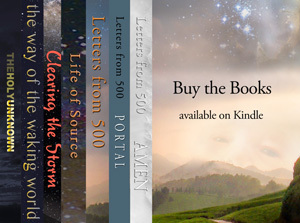 The final book in the Letters From 500 series is now available through Amazon and you can order it by clicking on the book’s cover, at the bottom of the Order Books page. In the meantime, we will offer excerpts from the book from time to time starting with the “Author’s Note” below. It has never been more obvious than it is now that we pull into our conscious awareness the great possibilities brought to light by the wisdom of our future selves. This bothersome fly of the moment, that keeps buzzing around our head, is just a speck in the grand scheme of human survival and the next step in human evolution, conscious evolution. Don’t let this flick of time, our time, mark the ‘everything there is and nothing more’. Breathe in the words of The Holy Unknown and bring peace into your eternal soul. in these dialogues, reasonable to consider? ‘Letters from 500’ is not only a series of books but an idea that is taking shape in moving the future of our species into a more enlightened way of living. We find it necessary to bring to life anything or anyone that promotes healing from our destructive ways and awakening of our sleeping consciousness. There are so many incredible minds and hearts on this planet, with imaginative ideas for change, but our eyes are sometimes blind to the immenseness of the message. Nothing challenges one’s sense of inner peace more than the fear of being accosted. Whether it’s a mental attack or one with severe physical consequences, the idea of being accosted sends the nervous system into a torrent. A torrent of fear, of anger, of confusion and of shame. It seems that out of weakness one will accost another to achieve control. Lacking a feeling of worth, this control gives the predator the satisfaction of over-lording its victim and stealing away the self-worth that allows one to move through life with a feeling of grace and poise. There is no excuse for this behavior, and in an enlightened species, this behavior will be eradicated. In the meantime, we have it in our lives. With all the attention to ‘rights and wrongs’ these days there is an energy among us to bring these corrupt behaviors into the light of day. “The Women’s March,” “The March for Our Lives,” “Black Lives Matter,” “The Teachers March,” all these demonstrate the ability to confront a Patriarchal society bent on the destruction of the human spirit. The idea that greed is the foremost driving force in surviving this world is a sad testimony to our ability to transcend the brutal egoic nature of man, and move ahead into an enlightened body where the one tenet that should be primary in our life is “do unto me as you would have me do unto you.” This simple thought could turn a caustic existence into one of peace and harmony. What’s this darkness I perceive, though my eyes are opened wide and the light of day yet lingers? What’s this darkness creeping through, like the herd approaching in thunderous waves? This dull blurred form, I’m trying to understand, crying to understand. This dulled blurred form wrapped in the tatters of gullibility. Guiding me to follow, leading me to unbelievable places. To places where truth is just a four-letter word. Guiding me to bend my mind in so many twists and turns. Like a coaster off its rails. Follow it into the crannies where confusion reigns. It informs my mind, my eyes so blind. It’s here to satisfy my fearful thoughts and direct me in ways I cannot imagine. It is the ruler of misinformed constituents. Fear me, it says, even as it allays my fears. It is pushing another story, something it wants to share, something skewed away from the reality of life. Something beyond compare, it promises, something beyond compare? I stare at it, beware I stare. For the eyes have spied the lies inside. Maybe we are all just doing exactly what we are supposed to do. But, in the struggle to believe that we should dress for success, reach for success and die for the success we succumb to the great lie of our time. Success is in the eye of the beholder. I love the word ‘mediocrity.’ It’s so demeaning. Isn’t there a place in life that’s just this and just that and no need for anything greater? Here’s how I see it. How do you see a life of mediocrity? You walk to the edge of life, looking at those masterful minds, monsterful successes, lives hell-bent. At the edge, you see me and you and those whose lives have shown least for their hellish bending. What went wrong? That voice resounding, nothing wrong, ever so strong, ever strong. No sad song. Life metes out the balance on one foot and then the other. Teetering, almost balanced, teetering, finding balance, You land it, you accept it. Arms outstretched, eyes closed, we dive into the realm of possibilities and come up with equal chance, equal choice, all possibilities destined for greatness in its own right. Nothing wrong. Success is to live a life at best, no matter what. What matters is how we see the life we offer up. Respect our life, respect our plan, there is no other plan, man. Climbing ladders to the stars, missing moments. Grabbing, clutching, opportunities whizzing by like meteors far away. Sadness all around, this lack of understanding. It’s not what you get, it’s what you get, understand? Realize who you are and aren’t. There’s the place to start. Balancing your art. Your craft is you, your self, your being. Balancing, rebalancing and bouncing back again. Societal norms aren’t normal, they’re elusive, inconclusive. Societal norms are victimizing, sanitizing, ever binding, fault reminding. Societal norms aren’t normal, they’re berating, self-degrading, thin skin chafing. That’s not right, not right, you see mediocrity is a spoof. A nowhere land, a goof. Do you see the dream of this land, do you see? The land of dreams, it’s not. Then you are along with the crowd, and the crowd is loud. If you are here and pleased with your mediocrity, then you are real, and real is the deal. Not seeing it at all, that’s the call. How minuscule, how thinly masked, that grit that makes us tall. We think us greater than all else, and yet we play, as toys. We travel in a mindscape vision, mighty lost in the wrong perfection. How silly, was there all along, just lost in my self ‘miring. The magic of life so willing, so game, to love us beyond cosmic death. In my last post, I said we would bring Light to the scene in 2018. Believe or not, there are a myriad of candles blazing brightly out there. A FaceBook friend (thank you Steve J.) posted this recently and I found this a grand idea and a way to bring harmony into our lives. Imagine putting yourself into a choir, a random choir, singing not just for the fun of it, but as a way to spread that harmonious feeling amongst each other. There are so many possibilities. Not only does singing in a group bring joy into the heart, but it can clear out the cobwebs and make fresh for new ideas. So, whether you’re great of voice or tone-deaf, try it out. Even in this alone time, sitting here in front of the screen. Turn up the volume or put on the headphones and hum along. I promise you will feel better for it.